The ship stood still as I slept on the deck with one of me charts covering my face. It was a pleasant night and the stars were out in the full. Suddenly the calm seas were disturbed by a mild gust of wind. The chart flew off my face waking me up. The breeze carried the chart with it alarming me. That chart was important because it lead to...uh I forget. But carrying on with this little sea tale, I chased after the flying chart to the edge of the ship. That was when I saw a flotilla of ships heading somewhere. Not wanting to miss out on the action. I followed the flotilla clandestinely. The ships stopped and out came the dinghies as their crews rowed their way towards the land. I got a few of me mates as we rowed our way to the coast. I tailed the crews as they disappeared in a large structure. On entering the structure, I heard of a grub party in a place called Aqaba. What serendipity! Now where would Aqaba be. I pulled out my pocket watch (actually my smartphone) and exclaimed "I am late." The actual fact was that I wasn't late but that comes with me being a punctuality freak. There was no hint of where Aqaba could be. I made a few circumambulations around the Peninsula complex until I found a security guard who pointed me to the right direction. The event was a massive meet up of 'almost' everyone in the food blogging/reviewing sphere that I hold dear. So as expected, Aqaba was raided at dinner time by a motley platoon of hungry food writers. The name Aqaba seems to be inspired from a coastal Jordanian city and a popular tourist destination. Though the inspiration stops just at the name. The place had a very western feel to it. 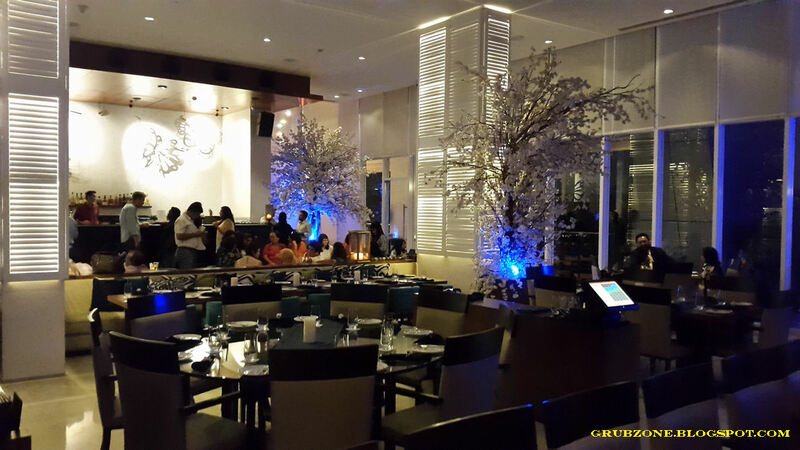 There were also some Sakura like trees added into the ambiance which makes the place resemble an upscale New York restaurant. Its housed within an office complex so it can be hard to find your way around. The dining area is huge and its surprising how such a big restaurant can be hidden behind that small door.. Its almost like someone played with the fourth dimension while constructing the restaurant. And if that was not large enough, Aqaba had a beautiful courtyard for banquets and possibly wedding parties. The courtyard had a breath taking view of the city's skyline. Methinks that this place on its own could make a very good roof top restaurant. 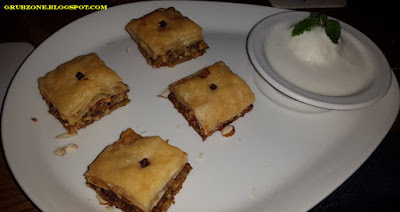 Aqaba comes out to be a Lebanese restaurant initially but it is a mixed bag with dishes from Lebanon, Morocco, Palestine, Jordan, UAE and even European countries like Greece and Italy. Its safe to say that you will always find something worth your moolah in Aqaba. 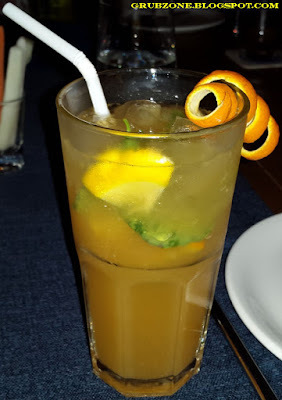 The meal started with this brilliant looking Virgin Orange Mojito. But the flag off was a bit bumpy since this drink despite its enticing visuals lacked both tang and sweetness. I could not find myself finishing it since it lacked flavor completely. Kakabia soup looks like a curious misspell of Kakavia. While it did not quite resemble the ancient Greek delicacy being a bit higher on the broth and lesser on the seafood, the concoction was still heavenly. The stew was quite delicious. 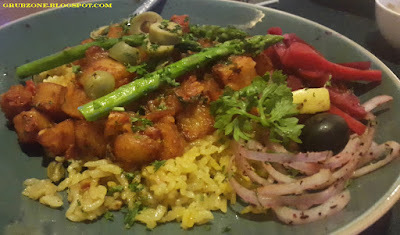 The flavor was salty-savory with prawns dominating the flavor. This soup made me forget the drink at the start and I considered this as the real start to the evening. 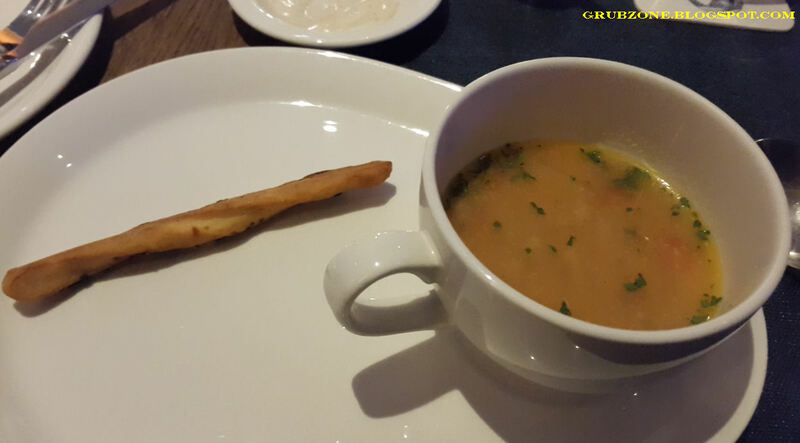 The bread stick did not quite pair well with the soup so I left it out. Its a soup that smells of adventure while sailing across the Mediterranean coast. Captain : This soup brings back memories of me adventures in the Mediterranean. Crewmate : Those were good times Cappy. Captain : We are still young lad. This Kakavia inspires me to set sails again for the those tranquil seas and the warm sun. Marakkesh Spiced Pita was a Moroccan twist to the regular Pita. Rubbed with a spicy North African mix, this pita platter found a lot of fans across the table. I found myself stuffing three or four of these. It was clear that Aqaba tried something different than just dumping a platter of pita on the table with some dips. And like most times, creativity scored. 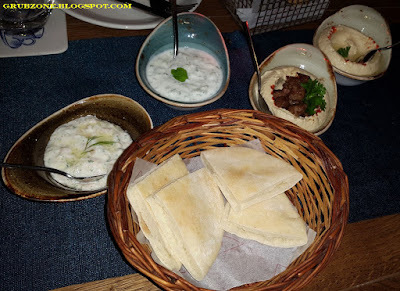 Regular Pita Platter - Despite the above, Aqaba did offer regular pita with an assortment of dips including the old favorites like Hummus, Tzatziki and Baba Ganoush. Though the old favorites fell flat from a flavor point of view, there was another dip in the set. The dark horse of the show. This was the Norwegian Smoked Salmon and dill dip which instantly became everyone's best friend. Not just pita but this dip found its way to pizzas and everything and anything else. It was almost a savory version of Nutella. To quote somebody on the table, "Man even cardboard would taste great with this dip." Captain : Lad lets pilfer this salmon dip and make a run for it. Captain : Oi, Are you listening? Captain : Captain to dullard. Can you hear me? Captain: Aye, that's getting weird now. After the pita appetizer course, the mains appeared on the horizon. Batata hara is supposedly a Lebanese spiced potato dish. I have not had it before so I cannot comment much on it. But its safe to say, that it was probably not close to the real deal. The old and wise Internet suggests that neither the flavor nor the appearance mimicked the original. The dish found no love across the table as it was moved like dead weight by people trying to make space for better stuff. Harissa Humus and Chicken Shawarma was a colossal disappointment for something priced at INR 600. 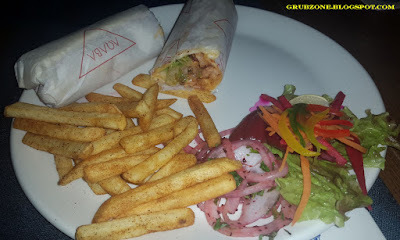 Being a Shawarma lover myself, I have had better Shawarmas at Maroosh and the like at a quarter of the cost. The Harissa was either too less or absent. This Shawarma lacked the succulent juiciness that the meat in this preparation usually has. The Paesana Pizza was the best highlight of the evening. Despite its curious naming, the pizza itself was one of the best that I have ever had. The smoked sausages and roasted chicken were cooked in the absolute perfect way that I can imagine. The flavor was smoky, salty and addicting. The sausages were of premium quality. 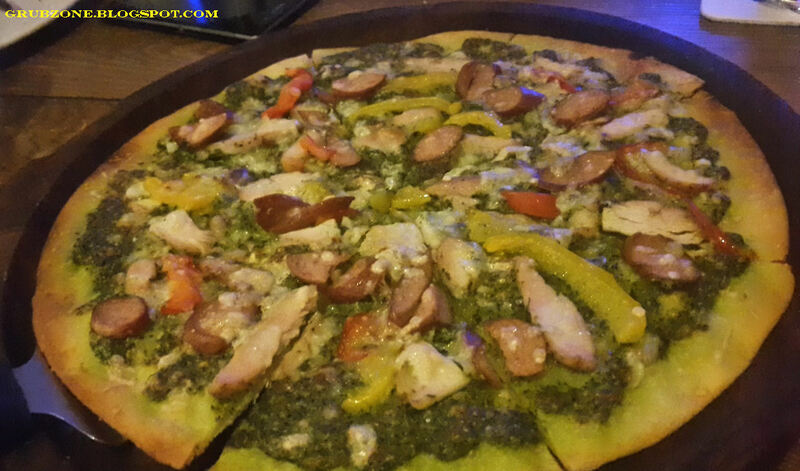 It reminded me the pizzas which I had as a child at Narulas in Delhi. Till that day, I had been looking to find a pizza with similar taste and had been unsuccessful. Aqaba fulfilled this decades long quest of mine. 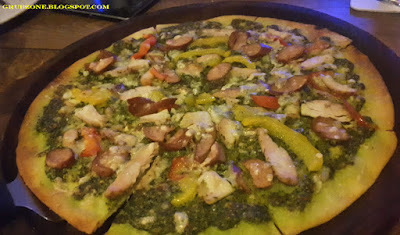 Though the basil pesto did not contribute much to the flavor, it still helped in making the pie visibly and aromatically enticing. The pizza was definitely a ten on ten. Captain : This pizza takes me back many years. I have been searching for this my whole life. Crewmate : Just like the white whale? Captain : That's Captain Ahab you barnacle headed scallywag. The Moroccan Fish was perhaps the most debated item among sea food lovers on the table. 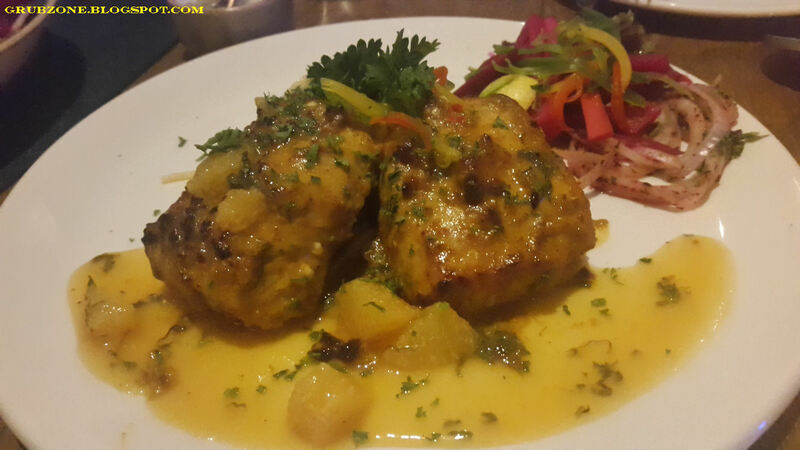 While at surface, it appeared well cooked with a good mix of spices and orange butter. The interiors however suggested that fish had been overcooked a bit. As such the dish ended up being an average preparation despite having immense potential. If the cooking had been just right, this could have easily been one of the stars of the evening. 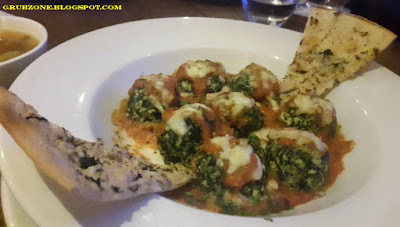 Malfatti con Spinach E Ricotta was a hidden gem in the menu. When it arrived, a lot of us conservative protein folks looked at it with one eye. However like the adventurous epicurean that I claim to be, I fished out one of these spinach and Ricotta dumplings on me plate and ate it. And everything changed then. There was sudden silence and everything else vanished from the sight. These baked dumplings dipped in a tomato Parmesan sauce were the only things in sight. Mansaf is supposed to be a Jordanian equivalent of Biryani. Just loaded with more meat than rice. 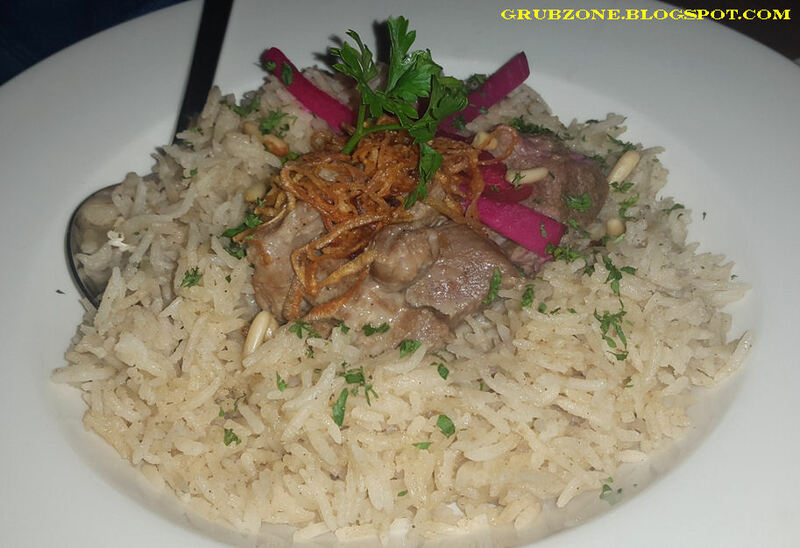 Aqaba's version appeared uninspiring resembling a mediocre Stroganoff. The flavor felt very dry and the rice tasted unauthentic(Tasted like Boiled rice) for an Arab dish. Its fair to say that this recipe needs a rework. Mansaf did no Insaf to the recipe. 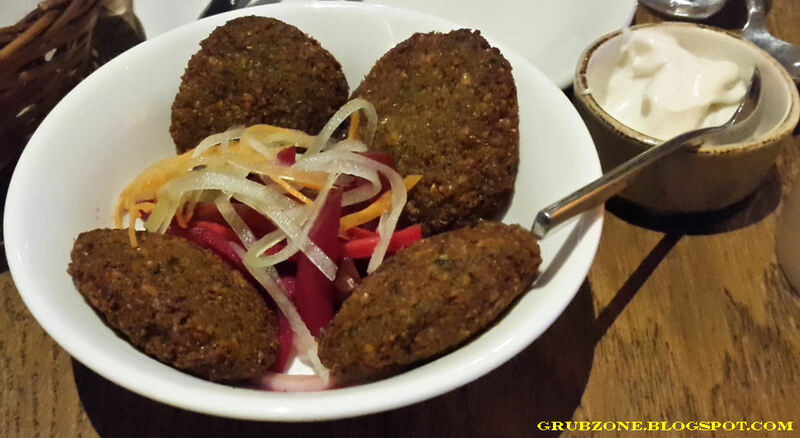 Falafel is one of the few vegetarian dishes from the Middle East. Its usage of chickpeas makes it a tough preparation in India as most Indian chefs often end up making moong dal vadas or local Chick pea variants instead. Aqabas variant remains true to the Arab recipe and I found the flavor to be consistent with the Falafels that I had in Dubai. The taste was rich and went well with the hummus. Aqaba scored highly on desserts as most of them were devoured before I could lay my eyes upon them. That tends to happen in large meet ups where people's primal instincts takes over their refined connoisseurs personas. In a fight of the strongest, I managed to purloin a few portions. I would have been happier if Aqaba had considered the fact that a single portion of their pretty desserts will not be enough for fifteen people across the table. 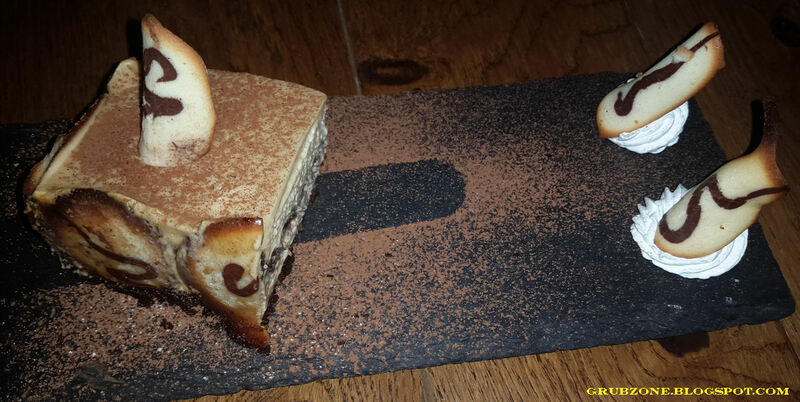 Aqaba's Tiramisu was easily one of the best that I had in Mumbai. The item was well plated and tasted well. Just a little complaint would be that it was perhaps a bit too bitter than expected. Captain : This looks pretty. Tell you what lad, let me have all of this and I shall give you a week of any duty you desire. Crewmate : Can I be a part of all the landing parties for a week? Captain : You got it lad. Crewmate : Sweet, I was not a Tiramisu person anyway. The Baklava felt very mediocre in flavor. I won't say that these pastries were bad but I have had better. 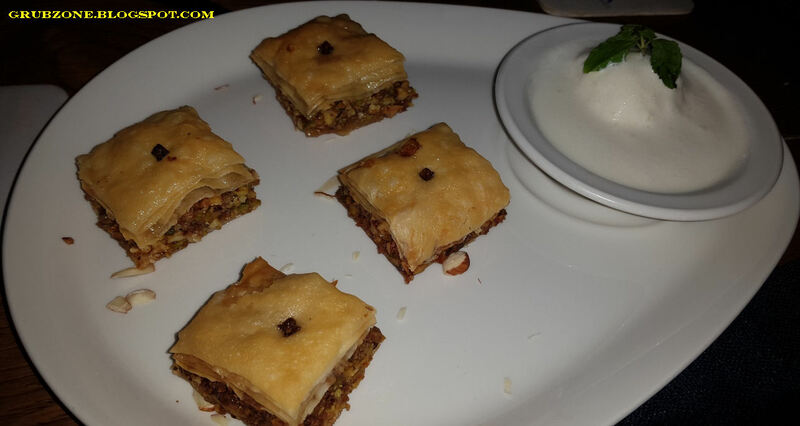 Perhaps, I was expecting more from Aqaba since Baklavas are common across a lot of Arab countries, Greece and Turkey. The Baked Yogurt was a fun dessert for those who are fond of Yogurt. The berry confiture provided a sweet tang to the dense liquid below. The presentation was quite good too. 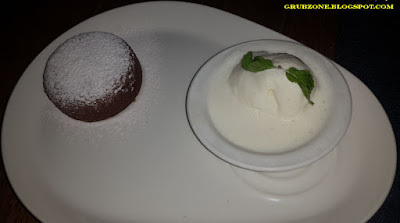 The Chocolate Fondant was average. I found the liquid to be less sweet and viscous than expected. The crust was a bit dryer than normal. The pricing for Aqaba tends to be diverse. While some items feel well worth the money like the Malfatti and the Paesana pizza is a steal at INR 475. I am still curious how the Shawarma can cost INR 600. The service was all right but could certainly be improved. The servers were not well informed on the dishes and we had to collectively put our gyan (Knowledge) to play on analyzing the dishes. In totality, Aqaba is a pot pourri of many cuisines. Emirati, Lebanese, Jordanian, Moroccan, Greek and Italian seem to form the core of their menu. And strangely to me, their best dishes were from their Greek and Italian fare. I would recommend the Kakabia soup, Marakkesh Spiced Pita, Paesana Pizza, Malfatti, Rose petal Ice cream (this was apparently served on our table and vanished in seconds) and Tiramisu. "All right lads, we leave as quietly as we entered. Out from this concrete complex and back to the Blue seas where we belong. Until next time." Sampan at Novotel - Juhu, Mumbai.